In terms of interest, Virtual Reality (VR) started to take off in 2015 and has been raising in popularity ever since. Lately, it experienced an all-time high in Google searches. However, there was not only interesting development in search volume but also in sales volume, especially for Sony’s PlayStation VR. The market research company SuperData initially estimated that it will sell 2.6 million devices by the end of 2016. Recently, however, SuperData downsized that number to about a fourth, to about 750.000 (see chart). 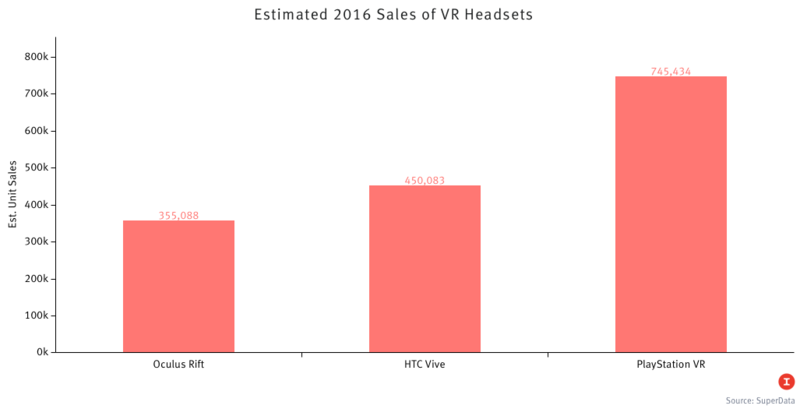 Nevertheless, the PlayStation VR is estimated to outsell the Oculus and HTC Vive headsets by more than 100% and 60% respectively. Whether the updated prediction is true is hard to tell. Assuming it is, makes me think if that can tell us anything about the critical success factors for VR. Considering the headsets’ different price levels one might assume that to be the reasons for Sony’s success. To use Sony’s VR you need a PlayStation 4, to use the Vive or Oculus you need a PC. Bundled together the PS4 and the headset (with controllers and a game) cost about $830. This is almost half of what the cheapest Vive ($1520) or Oculus bundle ($1320) cost. Sony’s lower price is especially interesting because VR is still in an early age. 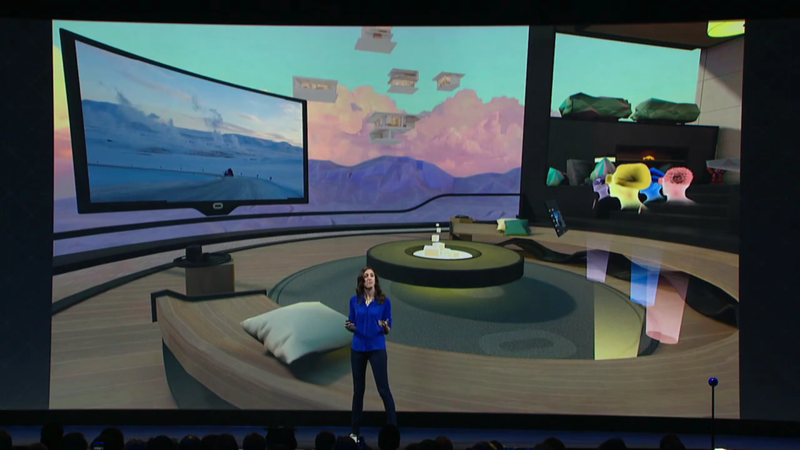 In this stage consumers have to figure out whether they like VR or not. Sony’s relative low price makes it, therefore, a better entry-VR headset than Vive or Oculus. And, whereas there is not doubt that price plays an important role in consumers’ decision making, the existence of premium products proof that customers are willing to spend more, provided they get something in return. One of the things people get with VR headsets are games, but of different kind. Although all models have apps for education (e.g. documentations), entertainment (games, films, news, sports etc. ), creation (e.g. 3D sculpting) and social (e.g. video chats), each of them places a different focus. PlayStation VR aims at console gaming (PS4), HTC Vive at PC gaming (Steam) and Oculus Rift on social. None of the uses cases are new; gaming, movies and social media all have existed before. What, therefore, is important is not what you can do with the headset, but how much it differs from alternative solutions. When comparing social networking and gaming in VR to the same applications on normal screens, the most exciting difference exists between gaming in 2D and gaming in Virtual Reality. I am not saying that the concept of socializing in Oculus is unexciting (look at the pictures), what I am saying is that the current state of socializing in Oculus is unexciting because what is most important for social networks, people and content, is missing. Friends and networks are, of course, important in gaming as well, however, less. Moreover, I think that social VR is too new for users because they have to learn two new things (using VR and socializing in VR). All that combined makes a gaming-oriented VR headset a better entry-device than others. Consequently, this makes Sony and Vive currently the more interesting models. Besides the appeal for gaming, what plays in Sony’s favor is its availably and publicity. Sony is not only wider wider known than its competitors, but has also higher availability than they. You can, for instance, get Sony’s VR at your local GameStop, Target and Mediamarkt (they and additionally Walmart sell it online as well). The HTC Vive, in contrast, is offered only at your local GameStop (GameStop and Walmart sell it online as well). Although e-commerce is rising, traditional retailers are still important. This give Sony a huge advantage. Thus, what the current VR-landscape can tell us is that low price, relative customer value, brand recognition and availability are important success factors. Honestly, this is not surprising. However, it is still important to highlight that gaming is not “the” application for VR; rather that Sony’s and HTC’s success could lie in its combination of price, availability, newness and brand recognition, at least in the short run. In the long run, it is going to be interesting to see whether social VR will have a chance. There are two things bothering me in regards to social VR. Firstly, the above-mentioned newness and, secondly, its isolation, i.e. that you are isolated from people around you while using it. Sony found a way around it with a feature called Social screen where you see a different screen on the TV and on the VR headset. For instance, this would allow somebody sitting next to you to give you the instructions showing on the TV. Currently, it is intended for gaming only, but in the long run I think that Sony sees it as entry drug to social VR. 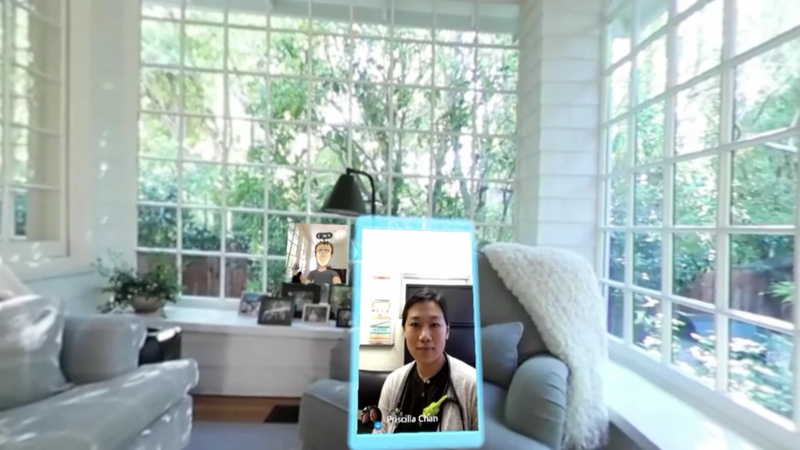 With the Social Screen feature on its VR device they are doing something very similar. And if they really want to transition to more than gaming, they are on a good way with their current strategy.